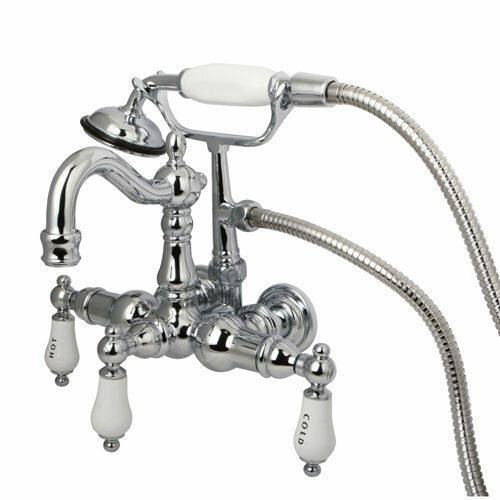 Kingston Brass Chrome Wall Mount Clawfoot Tub Faucet w hand shower CC1010T1: This Wall Mount Clawfoot Tub Faucet w hand shower is built to last. The highest quality standards are used to precision manufacturer a top of the line product. Important features of this BRAND NEW Fixture: Complete Item! Everything necessary for installation is included. - White Porcelain Lever Handle - Matching Accessories Available - Easy to Install - Installation instructions included - Wall Mount Clawfoot Tub Faucet w hand shower - Solid Brass Construction - Tub-Wall Mount Clawfoot Tub Filler - 1/4 Turn Ceramic Disk Cartridge - 8-3/4 Spout Reach - 3-3/8 Spread - Spout Height: 6-inch - Chrome premier finish designed to resist fading and tarnishing. This fixture is manufactured by Kingston Brass and is part of their : Precision Manufactured collection. COMPLETE ITEM: Everything necessary for installation is included! 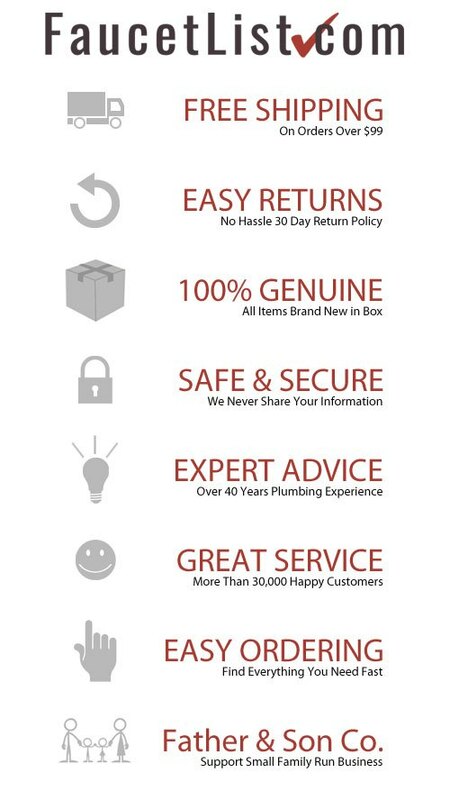 Faucetlist.com is an authorized Kingston Brass dealer so this fixture includes the comprehensive 10 year manufacturer's warranty against all defects. This warranty guarantees all faucets to be leak and drip free during normal installation and use. Basically if anything goes wrong anytime in the next 10 years you are covered - free of charge! Based on our experience, Warranty claims are few and far between - These products are built to last! One of the fastest growing brands in the industry today, Kingston Brass offers products that are affordable without compromising the quality of their design. Kingston Brass products include all the attractive aspects of a more expensive brand yet offer all this at a significantly lower price. Kingston Brass represents a great VALUE. If a solid, heavy, well-made product at a fair price is what you are after, you need look no further! Faucetlist.com has been a Kingston Brass authorized distributor for over 10 years. In that time we have sold thousands of Kingston Brass products. With this line of fixtures we have experienced a very high level of customer satisfaction and a very low return rate.